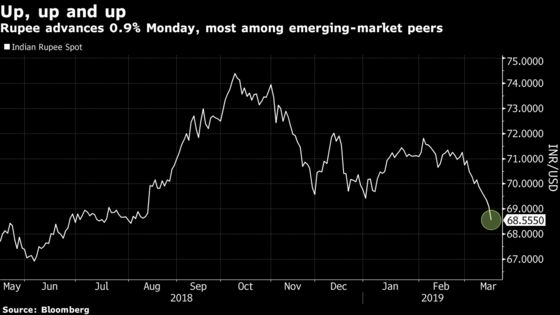 (Bloomberg) -- The Indian rupee continues to advance from strength to strength, cementing its position as the best performer among the emerging market peers. The currency advanced 0.9 percent on Monday to 68.46 per dollar, its highest level since Aug. 2018, widening month-to-date gains to 3.4 percent. The rupee turned the best-performing currency among EM peers as stock inflows surged, bolstered by prospect of Prime Minister Narendra Modi’s re-election following recent tensions between India and Pakistan. “The rupee has performed exceptionally well as geopolitical headwinds have not only subsided, but have turned into political tailwinds for the Modi administration, helping to shore up INR,” said Vishnu Varathan, head of economics and strategy at Mizuho Bank Ltd. “UST yields have continued to fall, favoring a higher yielding INR,” and the rupee could test 68 by end-March. The recent gains in the rupee have come on the back of $2.4 billion of inflows into equities this month, taking net foreign purchases to $4.7 billion, the highest in Asia. Global funds have raised holdings of rupee-denominated bonds by $833 million this month, according to exchange data.